It's been a while since we've posted a "Coney Island Death Watch," but developer Joe Sitt and his firm Thor Equities are clearing some of the land they own in Coney Island. Tenants got the boot from properties at the end of last year, and now, there are reports that a number of the Sitt-owned parcels are being prepared for demolition or will soon see demolition activity, including the Go-Kart track, batting cages and mini-golf course near the Coney boardwalk. 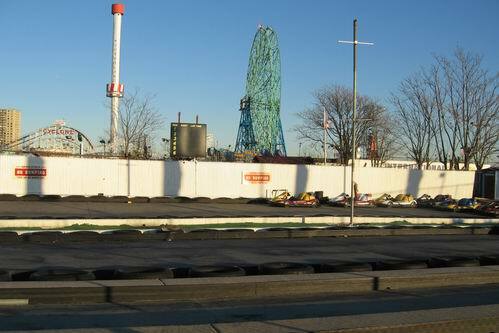 According to reports on the Coney Island Message Board, copper wire is being stripped, light poles have been taken down and some fences have been cut. The area will reportedly be cleared so that it can be "activated" quickly if the firm gets the rezoning it is seeking from the city that will allow the construction of luxury housing and retailing on the Coney Island properties that it owns. Meanwhile, the New York Post reports that Thor has start to "clear some of the land where its planned construction would occur. Bulldozers have begun removing longtime attractions on Thor property along Stillwell Avenue." There has been widespread speculation in Coney Island circles that Thor would move quickly to level buildings and attractions on property that it owns in Coney Island in order to increase pressure on the city to act on the zoning changes that it desires. It is thought that creating even more empty land in Coney Island, and the way it would make it appear vacant and unsafe, is a tactic to ensure quick approval of redevelopment plans. If the redevelopment somehow falls through, because Thor doesn't get the zoning changes it desires or because it can't line up financing, Coney would be left with blocks more empty, overgrown lots than it already has. Mail from Mr. Sitt: Deliberately "Grassroots" Look? Coney Island Death Watch: Is Eviction and Demolition a Bargaining Chip?